Sharp Corporation (Sharp) and Semiconductor Energy Laboratory Co., Ltd. (SEL) have found a new crystalline structure in development of oxide semiconductors (IGZO). Sharp and SEL have named this crystalline structure a CAAC (C-Axis Aligned Crystal) structure. Single crystal IGZO is characterized by having a hexagonal structure when seen from the c-axis direction and a layered form when seen from the direction perpendicular to the c-axis (see Fig. 1 (a), (b)). What we found in a IGZO layer is a hexagonal structure shown in a plane TEM image and a layered form shown in a cross-sectional TEM image, which indicates that the layer has a crystalline structure (see Fig. 2 (a), (b)). The name of the structure, the C-Axis Aligned Crystal （CAAC） structure, comes from this relation. 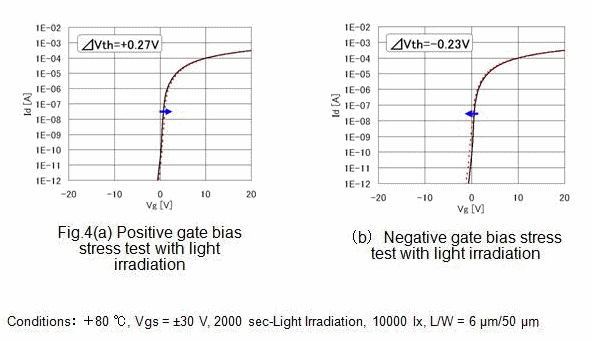 A conventional amorphous IGZO TFT has had a problem of shift in electrical characteristics in the gate bias temperature (BT) stress tests, especially in the gate BT stress tests with light irradiation. Meanwhile, a CAAC-IGZO TFT is less influenced by (is resistant to) the gate BT stress tests with light irradiation and has high reliability (see Fig. 4(a), (b)), which means that the TFT can be stable with CAAC-IGZO.